The challenge of modernising the instrumentation on an old utility boiler can be overwhelming, especially when the boiler was originally commissioned in 1964. Power utility base load preference has historically been the domain of the larger coal fired boilers. That has been the desired management approach for decades in the US. With the recent available abundance of inexpensive natural gas the emphasis has shifted to some degree to modernising gas fired boilers. Tightening emissions restrictions exerted by the EPA and local regulators make this an even more important avenue to explore. This particular tangentially fired ("T-Fired") power boiler hosts 12 Auxiliary Air dampers and 12 Fuel Air dampers, but the drives were failing in their performance and were simply worn out beyond their service life. Prior to the Outage: These aging damper drives & indicator switches were problematic. Two Type K DM-Series (Direct-Mount) register drives were installed in spring of 2014 as a test fit. These two pneumatic drives featured a limit switch module for damper position and permissive start-up reading back in the control room. Each drive also included a 24V DC dual coil solenoid compatible with plants existing DCS command system. The test drives performed admirably throughout the summer of 2014, enabling the plant to retrofit the remaining twenty-two drives in Sept 2014. The new Type K Drives save plant operators from making trips up and down the boiler. Typically they were dispatched out to the boiler to work on air connections, changing supply lines to the drives and dealing mechanically with any sticking drives. In addition the retrofit included installation of the Type K WB-1000 Damper Bearing Upgrade at each damper location. Quite often, the damper bearing is source of the problems found with dampers that have binding issues or are frozen in place. Often this looks like an actuation or instrumentation problem from the control room. Those symptoms contribute to a false read in the DCS. Some of the register dampers believed to have a damper drive problem were in fact frozen in place. Addressing both the damper bearings and the damper drives at the same time is very beneficial to ageing boilers. 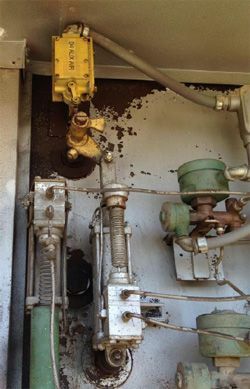 Part of the solution for instrument changes on the boiler relate to environmental constraints both today and those that may arise in the future. This is an area where the Type K Damper Drives are an ideal choice. The new drives are compatible with the current DCS system so the utility did not need to make any control room hardware or software changes. 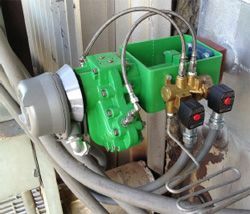 The register dampers are currently solenoid operated (24 V DC), but are also convertible for positioner upgrade in the event future environmental regulations force the utility to further reduce NOx output. The Type K design offers that flexibility. The utility staff personnel were able to complete the damper bearing and drive upgrades without a contractor, using only their own people. Type K supplied detail drawings with full installation and operation manuals along with a day or two of on-site assistance for the installation team. This offered a significant savings to the utility by eliminating outside contractor expenses. Overall, the installation went very well. By installing two test drives in early spring, the utility was able to see create a game plan for the main installation that followed. They installed the remaining 22 drives in about a week. That included removal the old drives, torching out the weathered shaft glands that were part of the original damper trim, then welding in the WB-1000 bearing upgrades into place. Once these bearing upgrades were set, the Type K drives were bolted firmly in place. The plant technical service team set the limit switches, installed air headers and flex lines to each new drive. 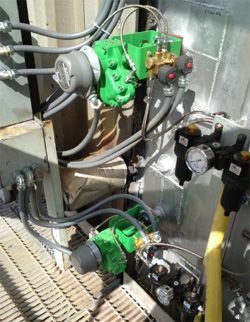 All limit switches and solenoids could then be field-wired and marshalled into corner-mounted electrical enclosures with flex conduit and wiring. Modernising a utility boiler is a common challenge with the aging of many of today’s existing power boilers. While the equipment ages, the experienced manpower decreases in many utility plants throughout North America. Couple those conditions with increasing environmental pressure to reduce emissions and you can better understand the squeeze that many utilities are experiencing. The Type K Series TK-2 Installed with WB-1000 Series Bearing Upgrade & limit switch module. 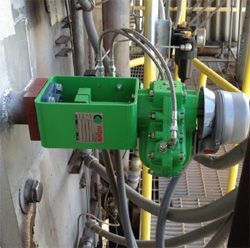 The solenoid and limit switch conduit connection points for the utility team were evaluated in the design phase at Rotork Dallas. Damper drives can significantly improve the efficiency and reliability of large and small boilers, furnaces, process heaters, and other demanding power plant processes. Together, Rotork and Type K have tens of thousands of damper drives in service throughout the USA and rest of the world. Furthermore, Type K damper drives are supported by Rotork Site Services’ extensive network of factory-trained technicians. How important are damper drives to your power plant facility, and what does the user gain with accurate combustion air and flue gas control? The precise control and fast operation of important dampers will increase the BTU/fuel ratio as well as the MW/fuel ratio. Added benefits are reduced emissions, improved boiler draft control, and lower fuel consumption, which can result in dramatic cost savings. Another important benefit is that Type K damper drives provide very fast operation and can be set to fail CW, CCW, or last position. Type K assists industrial boiler owners to comply with the EPA’s new boiler MACT rules. The U.S Environmental Protection Agency has published the National Emission Standards for Hazardous Air Pollutants for Major Sources: Industrial, Commercial, and Institutional Boilers and Process Heaters; Final Rule Jan. 31, 2012 in the Federal Register. This will affect 1,700 existing major source facilities with an estimated 14,316 boilers and process heaters. Retrofitting existing dampers with Type K damper drive retrofits provide a better, cleaner burn. The Boiler Maximum Achievable Control Technology (Boiler MACT) Rule requires boiler owners to carry-out tune-up procedures either annually or bi-annually. Two major components of the tune-up procedure where Type K damper drives directly influence boiler performance are the accurate control of the air-to-fuel ratio and in optimising CO emissions. Many boilers employ old-style technology that is neither accurate enough nor powerful enough to position the dampers quickly and precisely to mitigate emissions. Type K offers a Drop-In-Place retrofit solution that precisely fits the new damper drive into the application with no field modifications. The Rotork Type K Drop-In-Place retrofit programme provides end-users with a high-performance drive that can be installed without any field engineering or fabrication using basic hand tools in a short time. Existing connecting rods and linkages are reused without modification. Type K offers digital communications fully compatible with major open fieldbus protocols, including Profibus, Foundation Fieldbus, HART and Modbus.